How a bit of fishy business inspired Giant Sparrow’s sublime anthology. The authority on videogame art, design and play, Edge is the must-have companion for game industry professionals, aspiring game-makers and super-committed hobbyists. You can subscribe to both the print or digital editions here. Edge 320 features Shadow of the Tomb Raider on the cover, and it's available now. Welcome to the third guest article from Edge on PC Gamer, where we'll occasionally feature PC gaming-based articles from the long-running magazine's recent history. This was originally published in Edge 309 in July 2017, and is republished here with the Edge team's permission. Like all good stories, it started with a shark in a tree. Giant Sparrow had begun developing its debut, The Unfinished Swan, with nothing more than what writer/director Ian Dallas describes as “an abstract but describable goal”. For that game, Dallas hoped to create a sense of awe and wonder; this time he was hoping to evoke “the sublime horror of nature”. The process had worked once, so Dallas and his team were emboldened to try a similar approach for its successor, but it wasn’t until three or four months into development that the image of a shark in a forest, falling 30 or 40 feet to the ground, came into his head. Nature’s sublime horror suddenly had a comedic edge, and the story of young Molly Finch – the first of this familial anthology – gradually took shape. If the developer’s original plans had come to fruition, you might have encountered this fish out of water in its natural habitat. 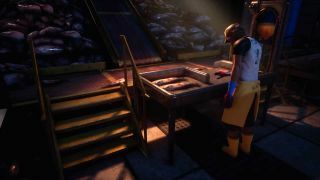 In its nascent form, What Remains Of Edith Finch was a scuba-diving simulator, inspired by Dallas’s memories of growing up in Washington state, and particularly “what it felt like looking at the ocean sloping away into the infinite darkness.” But in attempting to capture the sensations Dallas had experienced beneath the surface, Giant Sparrow hit its first major snag. “It’s really hard to tell a story while scuba diving,” he concedes. “Like, who is talking? What are the stakes? What’s the ticking clock? All these things that any story has to grapple with were hard to do.” Still, while the idea was abandoned, one early experimental prototype was a success. In considering how to tell a story in an undersea setting, Dallas wondered about inserting text into the world: a feature that not only remains in the finished game, but became crucial to the player being able to easily navigate the Finch mansion. Which of the stories went through the most changes? Walter’s. Essentially, it was a riff on the Weeping Angels story from Doctor Who and also The Prisoner. There’s this guy trying to escape this strange world of 1950s Americana, and he walks around with a flashlight, and when he turns around this crowd of people with pitchforks gets a little closer. Then there’s a gradual reveal that you’re actually in a model train set, and this giant hand comes down periodically to move things around. Walter picks up this little person who had tried to escape, and then realises that he himself has to escape and then goes out the tunnel [as in the finished game]. The version we shipped with was the last 5% of this absurd dream, and the whole can-opening part was a very late part of that process. Were you consciously trying to avoid the audio-log approach to storytelling? Yes and no. For me as a player, that’s just not what I think games do well. The part that’s interesting to me is: what does it feel like to be a giant tentacle? Or what does it feel like to be on a swing? And so from the early days, that’s where we spent all of our energy, just making these interactive prototypes, and the story didn’t come in until pretty late in development. Unusually, you can spoil the reveal of Edith’s pregnancy by looking down. not. I do really like that it’s something players can discover on their own. Some players are really blown away by it, and some like Neil Druckmann [who is credited as a playtester] – he just looked down, I think it was in the kitchen, and he said, ‘Oh, I’m pregnant’. And then he moved on (laughs). It was only right that Molly’s flight of fancy should come first in the story chronology, Dallas tells us, since everything grew organically from it. That key line, spoken with childlike guilelessness (“and suddenly I was a shark”) now seems like a disarmingly candid acknowledgement of the game’s unlikely origins. “It’s an introduction to the player, just like it was an introduction to us as developers, into what this game is going to feel like,” Dallas says. Perhaps more significantly still, Giant Sparrow would have been forced to cut the story Dallas calls the game’s “capstone”. The tale of Edith’s brother, Lewis, who drifts away from his job chopping fish heads at a local cannery into an imaginative fantasy world, it’s arguably the most enthralling use of systems to communicate a story – and in this case, a character’s mental state – since Josef Fares’ Brothers: A Tale Of Two Sons.